The Joseph Calleja annual concert took place at the Floriana Granaries last Sunday. 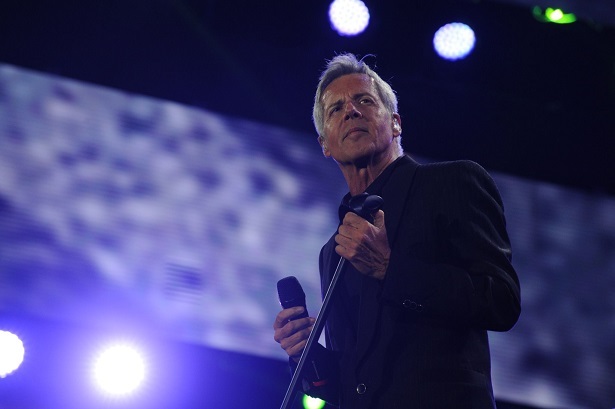 Apart from the Maltese tenor, the guests included Italian famos star Claudio Baglioni, British singer Leona Lewis and Welsh tenor Bryn Terfel. Watch highlights of the concert in the footage above, provided by the organisers. The Prodigy’s Liam Howlett and Keith Flint, who will be performing in Malta together third member Maxim on August 9, talk studio work, live gigs and Gozo raves with Ramona Depares. Lucca, 7pm. The whole town is buzzing with expectation and, even though it’s still a couple of hours to go before The Prodigy take the stage, crowds are already thronging the entrance points to Piazza Napoleone. The setting is the Lucca Summer Festival and this year’s headliner is the electronic dance group that swooped the title of Most Influential Dance Act in a 2010 poll by Global Gathering. In three weeks’ time, this same group will be rocking the Malta Fairs and Conventions Centre in Ta’ Qali. The Prodigy is one of the few bands whose following is mind-bogglingly diverse and includes sub-cultures that in other circumstances might shun each other. As old-school rockers rub shoulders with punks and teenage goth-heads, I see that I’m not the only one getting infected by the buzz. A young man who appears to be in his mid-20s, The Prodigy tee-shirt in hand, is trying to sweet-talk security into allowing him inside the backstage area. Security is not impressed. When it’s my turn I nervously flash my pass and heave a sigh of relief when it works. One step closer to my interview. We enter the production area and, almost immediately, Liam Howlett and Keith Flint, two-thirds of The Prodigy, come over. Maxim, the third member, is in the process of finishing up before joining us for a quick photo-shoot, we are told. I introduce myself and, as soon as I mention the word ‘Malta’, the guys’ eyes light up. “We love it there. You guys are great party people, that’s for sure,” Flint says. “Yeah, the Maltese were already kicking it by the time we started,” Howlett agrees. He is, of course, referring to The Prodigy’s first gig in Malta back in 2010. “It was really exciting to see that this big party was already going on. It was not quite what you expect. We knew the guys from [Maltese-born opening act] South Central and we knew they’d smash it, so we were aware that the Maltese are in touch with their music,” Flint continues. At this point, Howlett starts reminiscing about a week that he spent in Gozo “many, many years ago”. As enjoyable as it is exchanging Gozo stories with the two artists, I steer the conversation to their upcoming album, which has been scheduled for a late 2014 release. The band has already previewed at least five tracks – Jet Fighter, AWOL, AWOL Beats, New Beats and Spitfast – in their live concerts. Will they be including new material in their Malta set? Howlett assures me they will. What about the name? Flint laughs and shakes his head when I press him for a hint. Although the trio had originally fixed on How To Steal a Jet Fighter, recent interviews revealed a change of heart. “We are not quite ready to share it yet.” He pauses slightly. “Sometimes, the clue is in what we wear…in our t-shirts and things. Put it this way, everyone’s probably been in contact with the name at some stage. It’s been out there. But they haven’t opened their eyes to see it,” he says with a smile. Unfortunately, a quick look at what they are wearing leaves me none the wiser. The new album comes five years after their last one, Invaders Must Die. Before that, there was another five-year gap after Always Outnumbered, Never Outgunned. The gaps in between studio work is possibly the only gripe fans have with the band. Flint is pragmatic about the reason behind it. “We don’t want to be fully involved in the scene, we stick to taking bits and pieces of what we like,” Flint finishes off. “When you are recording, you always assume that that is what your followers want to own. But it’s only when you do the live shows that the feeling is re-inforced,” Howlett says. But by now, we can hear the fans outside screaming for said reward. It’s time for The Prodigy to get out there and destroy the stage. But not before one last parting shot from Flint. The Prodigy will perform on August 9 at 11pm at the MFCC, Ta’ Qali. South Central open at 10pm. Standard tickets are available from Burger King outlets. A truly humane society is measured by how it cares for its weakest members, namely the preborn, the ill, the disabled and the elderly. It is a society that attributes an intrinsic value to life in all its stages, be it an embryo, foetus, infant or adult. This is the present Maltese scenario, one of our strong unifying positions in a politically-divisive country. We are a people who still value life, appreciate life and care for our disabled and elderly brethren. Unfortunately, for most countries, commodification of life has become rampant. Prenatal diagnosis does not change the intrinsic value of life. The dignity of a child does not alter with a diagnosis of Down syndrome, cystic fibrosis, spina bifida or any other health condition. Disability-selective abortion is nothing more than a ‘search and destroy mission’ to kill innocent infants whose life is deemed ‘inferior’. This is a justified eugenics in search of the perfect child. Malta remains the only country in the EU that fully respects human life from conception. However, the unremitting pressure to comply with women’s so called ‘reproductive rights’, including abortion, remains. It might be pertinent for members of Parliament to point out to our European counterparts that we are free to choose protection of life for our preborn infants. Liberal laws and liberal people or countries are not really liberal when they threaten or try to coerce those who disagree with them into complying. Speakers from both political parties, to their credit, have consistently spoken out against abortion both locally and in political fora abroad. Recently, Environment Minister Leo Brincat defended Malta’s position against abortion in the Socialist Group meeting at the Council of Europe. It is thanks to the vigilance of such representatives that Malta is still free to choose life. Our stand for life includes respect for the humanity and fragility of the human embryo. Embryos have a right not to be intentionally manipulated and endangered, inherent in the fact of being human beings. The freezing of embryos constitutes an offence against the respect for human life at its most vulnerable because this procedure exposes the embryos to increased risk of harm and death. It also exposes the embryo to wilful suspension of his/her life. Playing word games with human lives endangers all of us and justifies anything. Achieving a pregnancy should not come at the expense of demeaning embryonic life. When we speak of ‘pregnancy rates’ without taking into account the humanity of the unborn, we risk going down a dangerous road that puts the protection of the embryo at risk, to say the least. As quoted in Times of Malta recently, Simone Attard, vice president of the Embryo Protection Authority, insisted that a 28 per cent pregnancy rate last year compared well with the 32 per cent success rate reported by the European Society of Human Reproduction and Embryology. This success rate without embryo selection and despite having no ‘freezing’ in the first year augurs well for the professionals working in this field. Professional training should increasingly be focused on improving this technique not resorting to ‘freezing’ as a back-up. If we are to remain a country ‘free to choose life’, we cannot afford any complacency regarding protection of human life at any stage. The fundamental principle that all rights flow from the human person must remain at the heart of our society. Playing word games with human lives, in the end, endangers all of us and justifies anything. True freedom is not to be confused with freedom from responsibility but implies a responsibility to our fellow man, including our unborn embryonic brothers and sisters. The Kayak for Charity 2014 Challenge got off to a great start on Saturday morning with the team attempting the return crossing Valletta-Pozzallo-Valletta on board of a double kayak in less than 40 hours. They left Marsamxett Harbour yesterday at 6am and arrived at Pozzallo at 10pm on Saturday night. They rested for a few hours, did some stretching exercises and left Pozzallo Port at 3am this morning. The Kayak for Charity team is accompanied by a support boat which is ready for any eventuality. Kayak for Charity has been using sports in aid of worthy causes since 2008, and this year’s challenge, supported by Frank Salt Real Estate, is in aid of Inspire, the Foundation for Inclusion that helps over 1000 babies, children and adults with learning and physical disabilities, reach their fullest potential by providing educational, therapeutic and leisure services. To donate and support the challenge, please visit http://fundraisingmalta.com/kayakchallenge/ or send an SMS with the word “Kayak” to 50618080 (€4.66), 50618926 (€6.99) or 50619215 (€11.65).